This is the second post of a series based on a talk I gave at the Fall CIO Summit in Baltimore on September 21st. When explaining what an ESB is, I like to use the “Water Main Pipe” analogy. A water pipe / water distribution system receives water from different sources and distributes it to houses; when you open the faucet, you get water, you don’t really care where it is coming from as far as it complies with a pre-established protocol: H2O, odorless, transparent, flavorless and a pre-established interface: Open facet -> get water , Close facet -> stop water. The ESB was born out of the need to move away from point-to-point custom integrations in order to connect heterogeneous systems. Reducing the custom integration code being spread among application and providing a centralized system to monitor and troubleshoot. The use of a Service Bus enables a seamless integration of different systems that at the same time can be data consumers and providers. An ESB can also be a broker for different systems of record – like CRM1 and CRM2 – being this completely transparent for the data consumer. 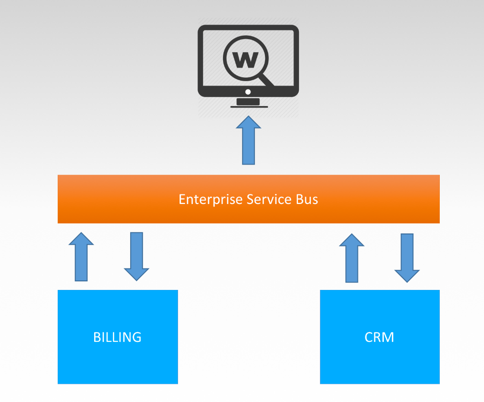 (Systems connected to a service bus can act as data consumers and data providers at the same time). 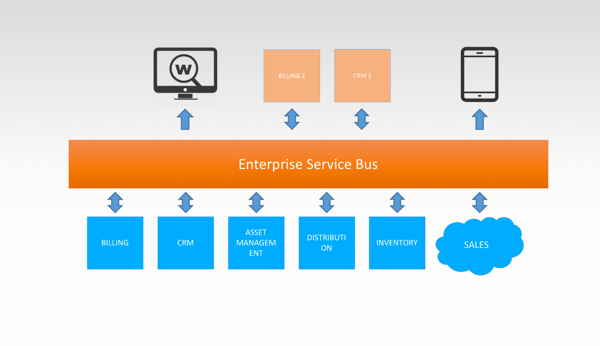 The ESB provides an unique point of entry and catalog to your Enterprise Services. Centralization and Standardization ease the use for consumers and the driving of best practices. 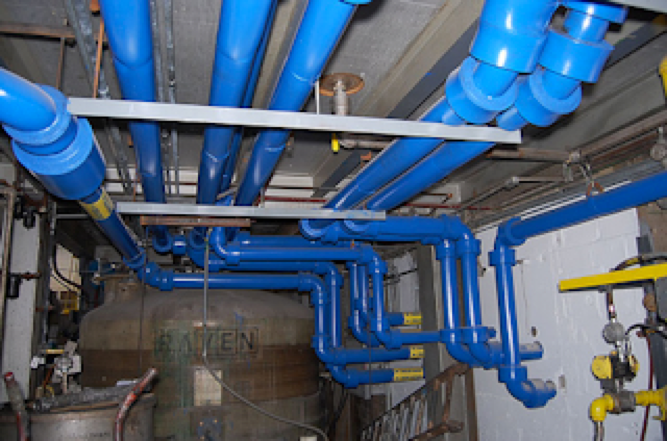 As pipes and valves in a piping system, the ESB takes care of routing information among connected systems as needed, in a way that is transparent for the consumer. Remember the scenario where we had two CRM systems? 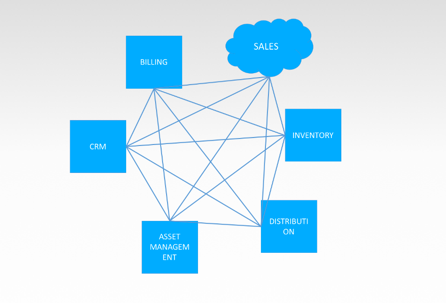 Routing capabilities allow consumers to get the right data from both systems. The goal for a proper ESB implementation is that all the Services available in your catalog “speak” the same language – follow the same protocol – however, that doesn’t mean that the data providers have to “speak” that language. The ESB can act as a translator and a mapper. This is what the consumers – like the Web App – will be accessing. Last but not least the Billing system exposes data to the ESB with SOAP services. The protocol conversion an mapping allows the ESB to not only convert SOAP and REST/XML into REST/JSON, but also re map properties to new properties (i.e. CMRFamily_ID -> AccountId). It is important to notice that when the data providers – CMR and Billing systems – act as data consumers, ideally, they access the services in the catalog with the protocol defined for the ESB, in this case REST/JSON. This feature allows to build some “cushion” with the underlying systems – data providers – and also build a “retry” strategy. Centralized security pattern unified to all consumers. Also centralized access control and audit. This is a list of few ESB offerings. I will not be expressing any evaluation or opinion on the products this time. We started with a monolithic application connecting and orchestrating 5 different systems. Luckily it was a hub-spoke design so our Metcalfe value for the network was still low. It took us 4 months to “service enable” our legacy systems and 2 more to orchestrate few of the services. We finished version 1 just to learn that version 2 will have to come soon. Every time we design a feature, we make sure that a Service Specification is part of the Acceptance Criteria. We wanted to keep our services lean and without much complexity and overhead looking forward to our mobile platform. Remember that SOA is not necessarily a synonym for Web services. SOA is a way to get where you want to be, it is an architectural guideline. It is not a product! You do not buy SOA, you do not build SOA. Come up with a good strategy and spend some time thinking about your base components (like security, versioning and naming standards – you won’t be able to change that often in the future). Then be agile, fail fast and work with MVP releases. It doesn’t matter if you decided to cache data in multiple systems for the sake of performance but you cannot have more than one system being responsible for the same data point! Think on business terms, not technology terms, who is going to be responsible for maintaining that data and which system they are going to use. Break down business functions into macro-level services and understand the relationships between them. Don’t think about software architecture, think about business architecture: billing, ordering, distribution, etc. Do not build things for a particular consumer, build things for all the consumers (the ones you have and the ones to come). The perfect catalog of services or the perfect API is self-documented, you don’t need to explain how to code against it. You will have to fight some fundamentalist software architects. Sometimes what is correct (like a canonical model) does not perform. I am not saying to go crazy and have 10 definitions for the same object, but think on ways to lighten your payloads. Version you services from day one, part of being agile means that they are going to change (sometimes too often). Salesforce for example, has never decommissioned an API version – they currently have more than 30. The use of a service bus brings with it the implementation of a single point of failure. Make sure you have a platform that can scale with load, have a failover system in place and do not get too crazy with orchestrations – orchestrate in the ESB only what makes sense.